"You also said poor kids lack a strong work ethic and proposed having them work as janitors in their schools. Can't you see that this is viewed, at a minimum, as insulting to all Americans, but particularly to black Americans?...I gotta tell you that my e-mail account, my Twitter account, has been inundated with people from all races who are asking if your comments are not intended to belittle the poor and racial minorities....It sounds as if you are seeking to belittle people." Gingrich Baited GOP Audience's "Bloodlust" — "He Ought to Be Ashamed"
"In that audience, with that kind of bloodlust in the air, an audience that was way over the line, way over the top, Gingrich was playing a dangerous game by playing to the audience and baiting people, appealing to their worst instincts, instead of their better instincts." — Politico's Roger Simon on Hardball, January 17. "Williams could see that saying that black Americans should want jobs not food stamps was insulting. Gingrich then laid into him saying that President Obama had put more Americans on food stamps than any other President. He got a lot of applause for that. Why would saying that get you a big, hearty applause? Because this whole conversation isn't about poverty, but about race....Gingrich is a smart guy. He ought to be ashamed of himself." "Quoting a New York Times editorial, 'In South Carolina, where a Confederate flag still waves on the front lawn of the state capitol, largely because of the efforts of the state GOP, it remains good primary politics to stir up racial animosity and then link it to President Obama.' Are you intentionally playing the race card to win votes?" — Co-host Ann Curry to Gingrich on NBC's Today, January 19. "These seem to be appeals to the extreme white wing of the Republican Party. That is to say that there continues to be among many conservatives a real resentment against blacks....I think this is very intentional, it is pandering, there's sort of a wink-wink that this base should be reminded that Barack Obama, President of the United States, is one of them, an African-American. Yes, I think this is very intentional. I think it is part of a hateful campaign that is being very methodically run in the hope it's going to appeal to voters who would love to see us return to the good old days of Jim Crow." 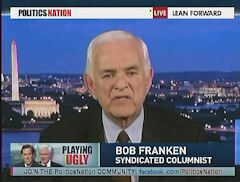 — Former CNN correspondent Bob Franken talking about the GOP candidates on MSNBC's PoliticsNation, January 6. "A post in my blog on Tuesday, about the undertone of racism in American politics, drew a great deal of angry e-mail and critical commentary....One thing I could have made clearer in my blog post is that racially tinged and outright racist attacks did not begin with the election of Mr. Obama. They have been going on for a long time, and yes, particularly from Republicans. This bitter strain was evident in my first assignment for the Times in the 1988 general election, when the infamous 'Willie Horton ad' was used against Gov. Michael Dukakis...."
— New York Times editorial page editor Andrew Rosenthal in a January 6 posting to his "Loyal Opposition" blog at NYTimes.com, referring to an earlier post that slammed the "racist undertone" of various Republican criticisms of President Obama. Heckling Romney: "Are You Going to Fire the Baby?" ABC's David Muir: "They were at a polling place in Manchester, the governor and his wife, holding a baby. Very much an image you'd expect from the front-runner. But if you rewind the tape and play up the sound:"
Man's voice: "Are you going to fire the baby? Are you going to fire the baby?" Muir: "Those shouts there, 'Are you going to fire the baby?' These are words that are going to follow Mitt Romney beyond New Hampshire right into South Carolina." '''I like to fire people' — I mean, I guess the only thing worse you could say is, in a time like this, when people are out of work, is that 'Herbert Hoover is my hero,' or something like that. I mean, it just boggles the mind." — Face the Nation moderator Bob Schieffer on CBS This Morning, January 10. When Romney said, "I like being able to fire people who provide services to me," he was plainly talking about individuals owning their own health insurance, so "if you don't like what they do, you can fire them." 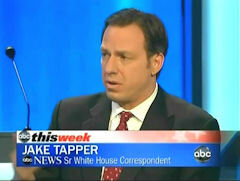 Anchor Brian Williams: "And couldn't you make the case the [Romney] family tree is an aspect of the Dream Act?" Taibbi: "Absolutely. His father could be the poster boy for the Dream Act." — NBC's Rock Center, January 9, talking about the fact that an ancestor of Mitt Romney moved to a Mormon colony in Mexico in the 1800s; Mitt's branch of the Romney family, including his father, moved back to the United States in 1912, 35 years before the current presidential candidate was born. "Impressive" Jon Huntsman, "the Sane Republican"
Correspondent Bill Whitaker: "The 51-year-old Huntsman has flown under the radar, despite his impressive resume....His economic plan, a streamlined tax code that eliminates all deductions and lowers all rates, has been deemed best of the campaign by the Wall Street Journal. Unlike most of the Republican field, he believes humans contribute to climate change.... [to Huntsman] You've also called yourself 'the sane Republican.'" Jon Huntsman: "My management style has always been to look realistically at issues. I don't pander." "With Huntsman gone, the field of Republican candidates has lost the only candidate who favored civil unions for gay couples and said he was concerned about climate change. 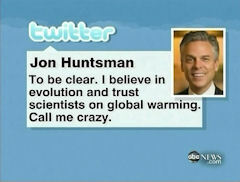 At one point, Huntsman tweeted: 'To be clear, I believe in evolution and trust scientists on global warming. Call me crazy.'" — ABC's Jon Karl on World News after Huntsman dropped out, January 16. "While sticks and stones may break your bones, the public inquiry into the life and death of Stephen Lawrence shows that words can and do cause irreparable damage to a culture and a society. Newt Gingrich is never going to win the Republican nomination, but he could badly damage race relations in the process. So here is a simple plea: Let's cut out the food stamps rhetoric right now before things get any worse." 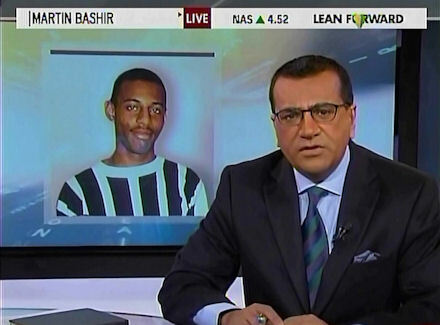 — MSNBC's Martin Bashir on his eponymous January 6 show, talking about the murder of a black teenager in London nearly 20 years ago, a crime utterly unrelated to the Republican nomination race. "On this night, this gym at St. Anselm College is packed with the most talented political journalists in America. There are the old and wise heads, who have covered many of these presidential primary races and I shall not name out of deference to their tenuous hold on their careers.... But the real question I have is this one: Is the Republican field worthy of the press that covers it?" — Politico's Roger Simon in a January 8 column about the Republican candidates, "They Are Not Worthy." "Given the enormity of what he inherited, and given what he explicitly promised, it remains simply a fact that Obama has delivered in a way that the unhinged right and purist left have yet to understand or absorb.... What I see in front of my nose is a President whose character, record, and promise remain as grotesquely underappreciated now as they were absurdly hyped in 2008. And I feel confident that sooner rather than later, the American people will come to see his first term from the same calm, sane perspective. And decide to finish what they started." Charmed by Radical Left's Latest Gimmick: "Occupy Igloos"
"Evidence that Occupy Wall Street campers are about to deploy again. Take a look at this: These are igloos. Occupy igloos. The protesters are getting ready to demonstrate at the world's fanciest conference, the World Economic Forum in Davos, Switzerland under way next week. And to do it, they are building 'Camp Igloo.' We are told it has a working kitchen and ice houses that will sleep up to 50 protesters." — Diane Sawyer on ABC's World News, January 17. Matthews' Flub: Government Grew By "Only 13 People"
"Well, here's the numbers, by the way, about the size of government. According to the U.S. Office of Personnel, the federal workforce totaled 4,430 people in 2009 when Obama took office. In 2010, a year later, the number increased to 4,443, a difference of only 13 people....I know it's always great rhetoric to say the government is ballooning, exploding with people. The government is getting bigger and bigger to this leviathan. And it's not." "He's the suicide bomber of the Republican Party....He's in it to take down as many people as he can as he goes down, and he has that same silly grin on his face when he pulls the plug as a suicide bomber." — Former CNN and MSNBC host Bill Press talking about Newt Gingrich on MSNBC's PoliticsNation, January 13. Slamming Talk Radio's "Right-Wing Nutjobs" with "Wacky Conspiracy Theories"
"The only thing that kept me sane as I stewed in D.C. traffic each afternoon [30 years ago] was listening to Bill Trumbull and Chris Core on WMAL. Theirs was a gently funny program: Top 40 music and the sort of light, friendly banter that wouldn't last five minutes on today's WMAL, which is full of right-wing nutjobs unspooling their wacky conspiracy theories." — Washington Post 'Metro' section columnist John Kelly, January 12, noting the passing of a longtime local D.C. radio host Bill Trumbull, whose old time slot is currently filled by Sean Hannity and Mark Levin. "Perhaps" the Media Were "a Little Bit" Pro-Obama? "If you look at 2008, Barack Obama had everything going for him. His opponent did not run a great campaign, picked a running mate that alienated some key voters, you had an economic crisis as opposed to a national security crisis. Everything going for him. You had the media, perhaps, tilting on the scales a little bit." — ABC's Jake Tapper on This Week, January 8.